The United States failed to achieve a doubling of exports between 2009 and 2014, as promised in President Obama’s National Export Initiative (NEI). It wasn’t even close. 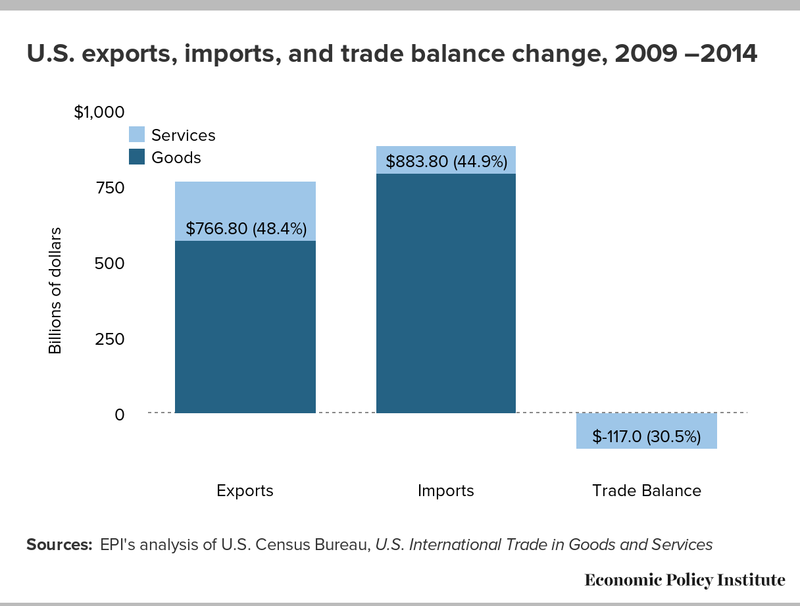 Total U.S. goods and services exports increased by less than 50 percent ($766 billion, or 48.4 percent) between 2009 and 2014 (estimated), as shown in the figure below. Meanwhile, imports increased by an even larger $883.8 billion, and as a result, the U.S. trade deficit increased by $117.0 billion. Expanding exports alone is not enough to ensure that trade adds jobs to the economy. Increases in U.S. exports tend to create jobs in the United States, but increases in imports lead to job loss—by destroying existing jobs and preventing new job creation—as imports displace goods that otherwise would have been made in the United States by domestic workers. Between 2009 and 2014 the growth in imports more than offset the increase in exports, resulting in a growing trade deficit, as shown in the figure. Growing trade deficits have eliminated millions of jobs in the United States, and put downward pressure on employment in manufacturing, which competes directly with most imported products. For example, growing trade deficits with China alone have displaced 3.2 million U.S. jobs between 2001 (when China entered the WTO) and 2013, with 1.3 million of those jobs lost since 2009 alone. The most important reason behind the failure to double U.S. exports over the past five years has been our inability or unwillingness to address currency manipulation. Ending currency manipulation would have reduced the U.S. trade deficit by between $200 and $500 billion. It would have slowed the growth of imports and increased goods exports alone by more than $1 trillion, enough to achieve a real doubling of exports. Better yet, it would have created between 2.3 and 5.8 million net new jobs, increased GDP by between $288 and $720 billion (2.0 to 4.9 percent) and reduced the budget deficit, at no cost to the government. Despite this, Congress has failed to pass legislation to end currency manipulation, such as Rep Sander Levin’s Currency Reform for Fair Trade Act (HR1276) and Sen. Sherrod Brown’s Currency Exchange Rate Oversight Reform Act (S. 1114), the Obama administration has not designated China as a currency manipulator (or any of the other 20 countries that have followed similar policies since at least 2001), and the administration’s has failed to take more meaningful steps to stop currency manipulation, such as instituting withholding taxes on government assets held by the foreign central banks of currency manipulators. The United States can double exports in the next five years, but only if we are willing implement tough new policies to end currency manipulation. The first step is to acknowledge the elephant in the room, and to recognize that China and other countries have been engaged in damaging currency manipulation that has increased U.S. trade deficits and cost millions of U.S. jobs.